Engineered (yes, in a lab!) to prolong shelf life of many foods, preservatives are linked to asthma and can be found in soft drinks, processed meats, chips, butter and margarines, dried fruits, wine and ice cream. In drinks a combination of sodium benzoate or potassium benzoate (212) and ascorbic acid (vitamin C, both naturally occurring and the additive 300) can result in the formation of benzene, a known carcinogen (Choice). 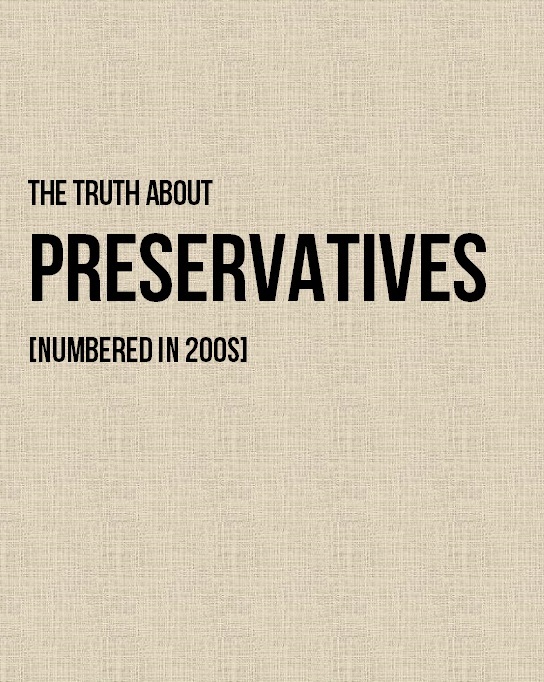 Overconsumption of cordials, juices and soft drinks can lead to excessive intake of these preservatives. Instead: read product labels thoroughly and if you can choose a product not containing any of these, you should do so. Read more on additives and ways to avoid them: Artificial colours, Antioxidants, Flavour enhancers. Hi! My name is Martyna and Wholesome Cook is a collection of yummy recipes and product reviews - a portfolio of sorts for my recipe development and testing business and a place where I explore natural, additive-free and allergy-friendly recipe ideas that come to mind. ‘We’ are based in Sydney, Australia.